The Green Party offers Canadians a clear choice and fresh vision to get us working together again for One Canada for all Canadians. But all progressive voters must work together to take back Canada, a Canada that earns the admiration of the world for our innovation and competitive spirit. As a member of the Green Party of Canada, I am honoured to be the party's candidate in the 2015 election for the federal riding of Carleton, a riding that traces its history back to Confederation. Despite its recent recreation, the riding of Carleton has a storied past. Once the riding of our first prime minister, Sir John A. Macdonald, later held by another prime minister, Sir Robert Borden, and twice contested by the late, great Canadian, Eugene Forsey. All, without exception, were public figures who believed strongly in One Canada and our enormous potential. For too many years now -- under Liberal governments as much as Conservative ones -- we the people have been treated as a mere sideshow in the "sport" of national politics, anesthetized by the masters of political messaging and spin. No longer is the national government an instrument of the people, governing for all Canadians. Nine years of the Harper Conservative government have increased the concentration of executive power so much that the political universe is dangerously controlled by the Prime Minister's Office. Nine years of Mr. Harper's diminished, unambitious Canada, governed out of his PMO, have made us less confident of the future, sitting on the sidelines, disconnected and divided from one another. The Conservative playbook is all too clear: pander to narrow constituencies, exploit regional differences, shrink the national government, and bypass Parliament. It means annual budgets set out in messy, everything-but-the-kitchen-sink omnibus bills, forced through Parliament with minimal debate, then sold to Canadians as so-called "economic action plans" through endlessly repetitive advertising that promotes the Harper Conservative agenda with our tax dollars. Mr. Harper has perfected a depressing cycle of unilateral change in Ottawa. From the insulated bubble of the PMO, Harper avoids what he considers to be the inconvenience of having to consult either citizens or governments. He constantly tinkers with our economic and other fundamentals only to serve shortsighted partisan goals and the next election. He thumbs his nose at our Constitution, makes a mockery of Senate reform, and picks fights with the Supreme Court of Canada. From science to the environment, from Employment Insurance to immigration reforms, from healthcare to infrastructure, and from anti-terrorism to the Senate, Conservative actions have all too often provoked counter-productive responses at other levels of government, and expensive, wasteful court challenges by Canadian citizens. All of this simply reinforces extreme citizen disengagement from federal politics, which Mr. Harper and Pierre Poilievre have entrenched by forcing through controversial reforms to the Canada Elections Act. And now, Stephen Harper, Pierre Poilievre and the Conservatives think they can buy our support with pre-election handouts or succeed in scaring us into voting for them through fear-mongering. Everywhere I go, people tell me that the Conservative government is well past its best-before date. Families tell me that there are better ways to help their children than the childcare benefit scheme currently being rolled out. Farmers tell me that it is time to put Stephen Harper and Pierre Poilievre out to pasture. Voters in my riding are concerned that the Conservative government is more interested in constructing a controversial Memorial to the Victims of Communism -- a costly ideologically-driven legacy project -- than supporting the massive infrastructure investments that our economy desperately needs right across Canada, and not just in Conservative-held ridings. This is not my first time in the political trenches or my first election. I count myself fortunate to have cut my political teeth helping to lead the fight against the Meech Lake and Charlottetown constitutional accords as a citizen activist. We were successful in building a multi-partisan grassroots coalition of Canadians across Canada, to oppose the attempt by Brian Mulroney to undermine the national government and the Canadian Charter of Rights and Freedoms. I have seen firsthand the power Canadians can have when we take action together for One Canada. We gave voice to the people and ultimately prevailed over the well-financed party machines led by politicians out of touch with ordinary Canadians. I then decided to take my commitment to strengthening One Canada into the 2006 election by running as a candidate for the Liberal Party of Canada. I believed then the Liberal Party could be the advocate for One Canada. Ever optimistic, I even entered the Liberal leadership race to make the argument that One Canada for all Canadians should be the Liberal Party's raison d'être. But the Liberal Party has not succeeded in becoming a real voice for the people. Rather than becoming an instrument for bold national leadership, it has decided to stay a mere electoral party machine, populated by elites determined to regain power for power's sake. The Liberal Party's cynical stand in voting for Bill C-51, its abandonment of any support for the politics of conviction over the politics of convenience, and the Party's continuing slide into incoherent policies on climate change -- the crucible issue of our time -- finally convinced me that I had to find another outlet for my political energy. So earlier this year, I joined the Green Party of Canada as senior policy advisor to the leader, Elizabeth May. By setting a high standard for thoughtful representation, reasonable compromise, and bringing Canadians together, Elizabeth May has strengthened the Green Party as a genuine party of the people, not the elites. A party of principle. A party focused on the future, not just the next election. In the Green Party, I have found the party of One Canada for all Canadians, with the ideas, credibility and energy to get us working together again. 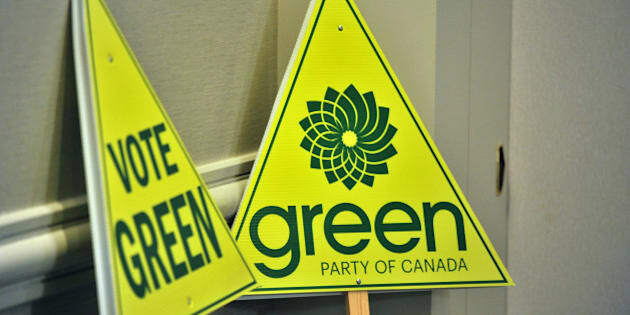 Parliament needs more Green Party representation if we are to succeed in restoring power to Parliament and raising confidence in the federal government's ability to act honestly and efficiently on behalf of all Canadians and the national interest. I am of the view that the animosity between the NDP and the Liberals is self-defeating and frustrating to the extreme. As long as the NDP and Liberals fight each other, valuable energy is diverted away from the critical twin goals -- holding the Harper government accountable for diminishing Canada socially, economically and internationally, and providing a coherent alternative to progressive voters. To this end, I will vigorously oppose only the Harper Conservatives and Pierre Poilievre. In the coming days and weeks, I will present clear positions and principles on issues of concern to Carleton and our country, with a view to convincing voters that this is the time to think outside the box and vote for something different. The Green Party offers Canadians a clear choice and fresh vision to get us working together again for One Canada for all Canadians. But all progressive voters must work together to take back Canada, a Canada that earns the admiration of the world for our innovation and competitive spirit, for the respect we show to our environment and Indigenous peoples, and for our commitment to social justice and support for the disenfranchised. The need is great and we can and must do much better for our country. We have to get back to the fundamentals of governing for all Canadians -- for the people, not the politicians. We have to move forward in building a Canada that matches our highest aspirations for ourselves and our nation.